Students paint a still life from observation in the style of the Impressionists. Gather a variety of natural objects. Place them on the table so it is easy to view them separately. Examine them, paying particular attention to the texture and patterns you see. 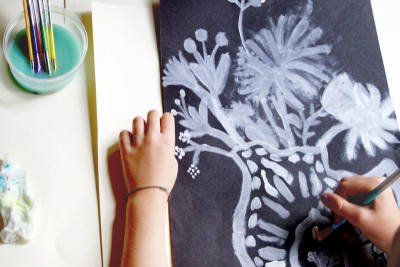 Use white paint to make marks that will give the impression of the objects’ shapes and textures. 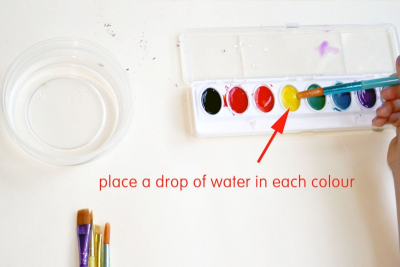 Place a drop of water into each colour to activate the watercolour paint. Paint colour on top of the white shapes. 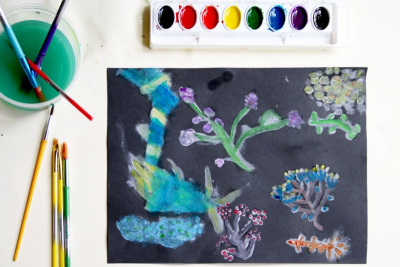 Use the watercolours to experiment with different ways to make the texture more interesting. 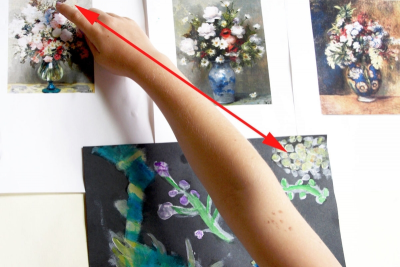 Compare your finished experiment with several Impressionist paintings. Look at the still life and imagine how you will paint it to on your paper. Pay attention to the shapes and sizes of things. Use white paint to block in the main shapes. Continue painting using only white paint. When you are satisfied with the painting begin painting watercolour on top of the white paint. - What textures have I created using different brushstrokes? - How have I used contrast to balance the composition? 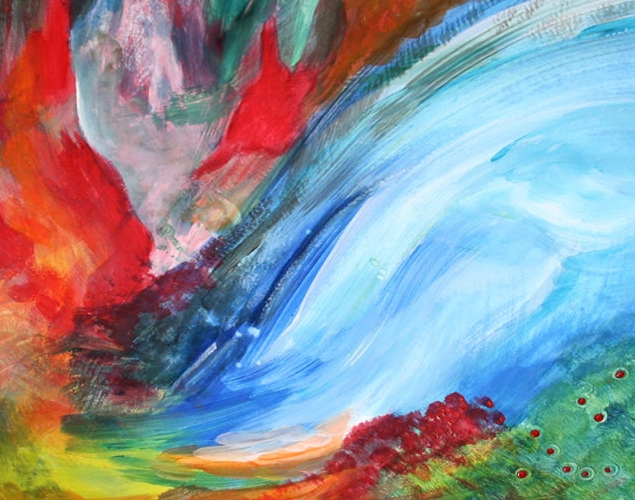 - How do colour, lines and patterns get my eye to travel through the whole painting? - How does the painting make me feel? invite their peers to compare and contrast the 2 images. Prior to this lesson have students gather a variety of natural objects. Teach about plants in Science class. Gather and display books about the Impressionists, for example, Monet and the Impressionists for Kids: Their Lives and Ideas, by Carol Sabbeth; Katie Meets the Impressionists, by James Mayhew; Linnea in Monet's Garden, by Christina Bjork and Lena Anderson; and Monet Paints a Day, by Julie Danneberg and Caitlin Heimerl. Arrange a still life of a vase of flowers (or other subject matter). Show students the natural objects and have one person from each group come and pick up several objects for their table. 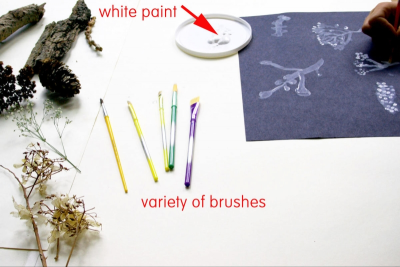 Provide white paint and a variety of small brushes for each table. 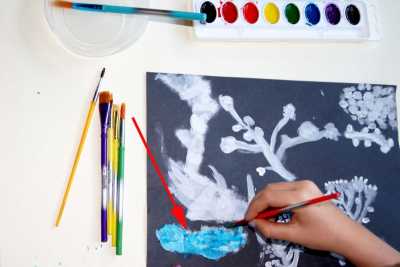 Demonstrate how to look carefully at the object and then paint a mark in white paint to represent it. Allow students time to paint about 8 objects. Demonstrate how to prime the watercolour sets with water, and then paint colour on top of the white paint. Introduce the Impressionists and show several paintings to the class. Ask students to see how their paintings look the same as some aspect of the Impressionist paintings they are viewing. 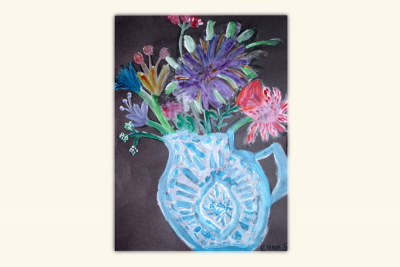 Paint a still life from observation in the style similar to the Impressionists. 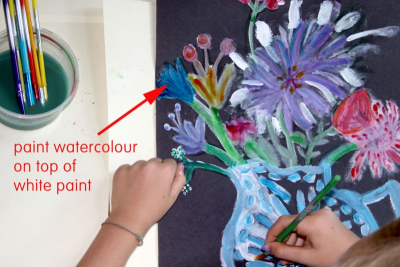 Use watercolour paint over white tempera to show texture and detail. Respond to the work of others and support your ideas with evidence found in the works. Place the still life in a central location – or have a separate still life for each group. Be sure everyone can see the still life with ease. Point out the proportions of the vase and its relationship to the flowers. Ask students to think about the best way to position the subject on the paper. When students have finished the white coat ask them to stand back and look at their work with ‘fresh eyes’ before continuing with the watercolour layer. Encourage them to make any adjustments. Display the paintings as a ‘body of work’. Ask students to gather in front of the display and look at the works thoughtfully and to find 3 things they find interesting about any of them.